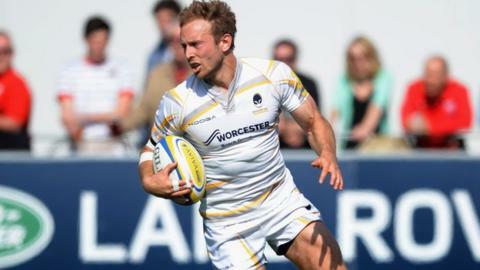 Worcester Warriors full-back Chris Pennell will stay at Sixways, despite the club's relegation from the Premiership back to the Championship. The 27-year-old, who is on the six-man Premiership Player of the Year shortlist, has been tipped for England recognition by his boss Dean Ryan. But Worcester will not consider sending him out on loan to a top-flight club. "Chris is in a unique position as he such a quality player but we're not considering any loan," said Ryan. Warriors allowed a similar arrangement when Worcester-born Pennell's team-mate Alex Grove was allowed to be loaned out to Edinburgh following their last relegation to the Championship four years ago. But Pennell has made it clear that he is more than happy at his hometown club. "We're trying to build something here," Ryan told BBC Sport. "That can be seen by what we've already done, with the signings of players of the calibre of GJ Van Velze and Sam Smith. "And that does not involve someone going off and playing somewhere else. "We're not looking to be a stepping-stone for anyone. Nobody has expressed an interest in any sort of loan move. "Of course Chris can play in the Championship next season. Why wouldn't he? "He should be playing for England, but his club's in the Championship, so he will be playing in the Championship." With Pennell in contention for a major award, he is likely to be under consideration when the tour party is picked for England's three Tests against New Zealand next month. Pennell will take to the field for Worcester for the last time this season on Saturday when they wind up their long, hard campaign with a home game against Ryan's old club Gloucester. If he plays the entire match, the Warriors full-back will complete the rare achievement of having been on the pitch for every minute of his side's 22-game Premiership season.